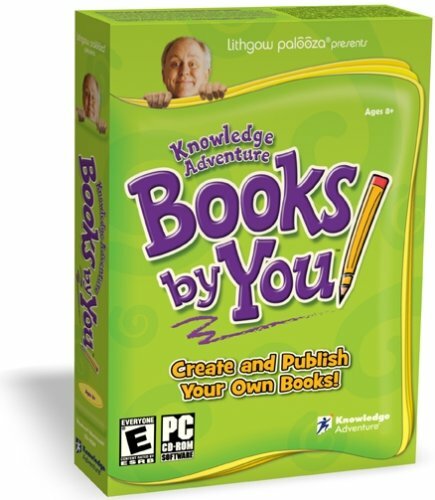 Knowledge Adventure (makers of the Math Blaster and Jumpstart education software) has joined with Lithgow Palooza Company on the high quality book creation software Books by You, for Windows and Macintosh. The software creates clever chapter books as Academy Award winner actor John Lithgow guides users through the creation process, which includes word fill-ins similar to “Choose Your Adventure” type series and giving characters colorful names. Choose from these four titles — Alien and the Cheese, The Wailing Alien, The Mystery of the Monkey Palace and The Case of the Missing Monkey. Lithgow articulates himself well providing plenty of helpful hints on context, character and plot development. Users can learn a lot of language skills throughout the creatively visual process. If you want a personal Christmas gift this year, then this software has all the goods. Users can include personal information, insert their own pictures, write an author biography and make a special dedication. Besides the book itself, users can promote the book with a customizable poster and/or press release. The editing process can be a bit challenging, mostly because you can’t see a blinking cursor – it’s just easier to highlight the text and then change it. Once finished in the initial process, users can go back and edit words and other special vocabulary words (all in colored text). Once the masterpiece is finished, it’s time to immortalize the work. Besides archived files in a “Books by You” folder, users can save their book as a PDF for sending by e-mail. Got a good printer? This unique software allows you to print-your-own-book right at home or order a professionally bound copy start at $9.99 each (soft back). Hardback print-your-own-book copies are also available. Prices are subject to change. Registration and a credit card are required. Registration includes the usual customer support/product news plus additional educational articles and exclusive learning tips. The software is suggested for ages eight and over, but would still be ideal for a regular toddler bedtime story made by the parents (imagine the discovery after years and years of night-time readings…neato!). For younger audiences, the templated stories are somewhat limited and quite lengthy for younger ages, but the graphic options and animated interludes can keep their attention pretty well. The software also allows for different users, so guests and friends can join the fun at home. The limitless learning and high replay value during the process is definitely worth the $19.99 suggested retailed price. Great for educators and writers. This entry was posted in Book Reviews, Video Game Reviews and tagged Book, Books, Michael Siebenaler, Mike Siebenaler, PC, publish, Tall Writer. Bookmark the permalink.